This property offers a rare combination of numerous recreational attributes, exceptional water and fishery resources, abundant wildlife, and is contiguous to over a million acres of national forest. 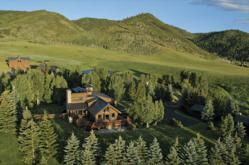 One of the finest Colorado fly fishing ranches has reduced its asking price to $13.9 million. Round Mountain Ranch, arguably the most versatile ranch in the Rocky Mountains, features an exclusive array of amenities for the sportsman and outdoor recreationist. The 1,132+ acre property offers a rare combination of exceptional water and fishery resources, abundant wildlife, access to over a million acres of national forest and world class improvements for a high-end equestrian and/or cattle operation. Located within 20 minutes of Steamboat Springs, CO, also known as Ski Town, USA, the ranch offers extensive improvements built to the highest standards, including a 5,126 sq. ft. owner's residence, beautifully restored river cabins, homes for guests and management, newly constructed barns, and a state-of-the-art indoor equestrian arena. For more information on this ranch or Colorado ranches for sale visit Hall and Hall’s website http://hallhall.com or call broker Jeff Buerger at 970/626-5151. Round Mountain Ranch is located in the heart of the Elk River Valley in the northwest quarter of Colorado, home to the largest migratory elk herd in the United States. The Routt National Forest is adjacent to the ranch and offers phenomenal hunting and fishing resources. Elk, mule deer, and bear are the primary big-game species found in this area. The agricultural operation on the ranch is suited for cattle, yearlings, horses, and a haying operation. This Colorado property, which has been featured in The Wall Street Journal, offers all three venues of trout fishing - river, stream and lake. The Elk River is a fertile, medium gradient river that mostly flows through private ranch land with limited public access. The average size trout on Round Mountain’s stretch of the river is 14 to 16 inches, with an excellent population of fish over 20 inches. The ranch's meadow stream offers a more intimate setting and was created by the leading aquatic habitat and fisheries restoration and enhancement firm, CFI Global. 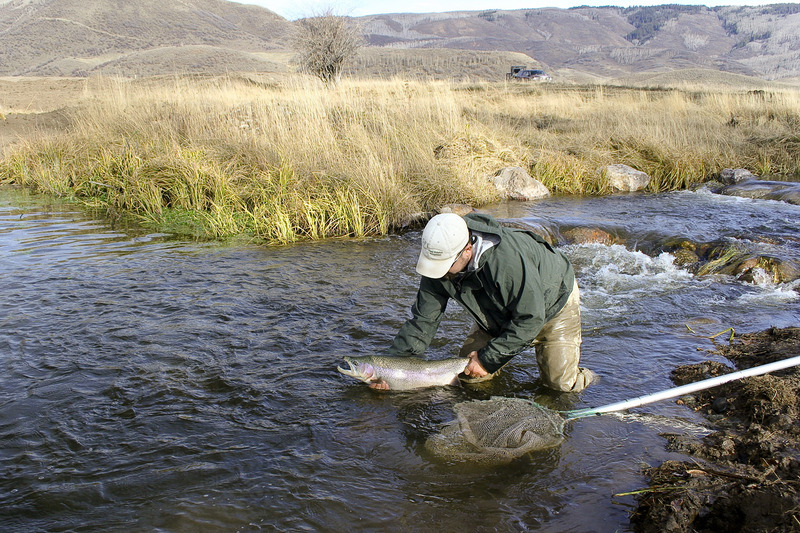 The stream averages 10 feet in width and supports year-round populations of rainbow, brown and cutthroat trout. The five acre lake is a great complement to the river and stream, fishing well even when they are unfishable during spring runoff. There are huge trout in the depths of this lake. Round Mountain Ranch is conveniently located near multiple airports and recreational amenities abound. Just 11 miles south of the ranch is the Steamboat Springs Airport, also referred to as Bob Adams Field. Steamboat Ski Resort is world famous for its characteristic Champagne Powder® and great tree skiing. Just north of the ranch Steamboat Lake is one of the most scenic water-ski and boating lakes in the country. Hundreds of miles of groomed trails and limitless backcountry opportunities make the Hahn's Peak area north of the ranch one of the best snowmobiling venues in the nation. The Steamboat community attracts a wide variety of events and attractions throughout the year, such as the Pro Rodeo, Art in the Park, Mustang Roundup, Steamboat Marathon, Balloon Rodeo, Wild West Air Fest and Winter Carnival. For more information on this phenomenal Colorado ranch, visit Hall and Hall’s website http://hallhall.com or call Jeff Buerger at 970/626-5151. Hall and Hall was formed in 1946 as an agricultural mortgage company, and has since branched out into farm and ranch brokerage, auctions, appraisals, resource management and enhancement, retained search, and consultation on conservation easements and stewardship plans. Hall and Hall has emerged as the largest full service rural real estate firm within the Rocky Mountain West and Great Plains regions, managing more than 800,000 acres of land, servicing a loan portfolio of more than $400 million. A unique partnership between its offices in Montana, Wyoming, Idaho, Texas, Kansas, and Colorado ensures that the client receives local knowledge and personal service as well as the international perspective needed to make informed acquisition and management decisions. For more information, join us on Facebook or follow us on Twitter @HallandHall. In 2000, the ranch partnered with The Colorado Cattlemen's Agricultural Land Trust to protect the exceptional agricultural, wildlife and scenic values of the property.Colorado ranch for sale, steamboat ranch for sale, fly fishing ranch for sale The improvements on the Round Mountain Ranch are in a word, impeccable. 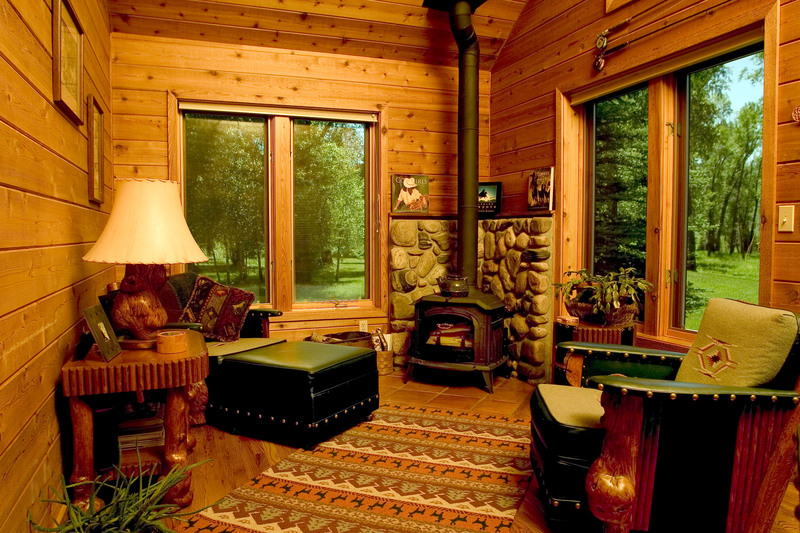 Under the current ownership, all buildings have been restored and all of them match in a tasteful and classy scheme with no expe It is quite rare to find a mountain ranch that offers all three venues of trout fishing - river, stream and lake - especially of the caliber and level of privacy offered on Round Mountain Ranch. Hall and Hall has been the leading full-service ranch real estate firm in The United States for more than 60 years. This is a complete brochure with maps for Round Mountain Ranch.